Worst tires I have ever had in wet conditions, not much better in dry. Only have 36,000 miles on them and they are unsafe at any speed on a wet surface. Maybe could get another 5,000 miles out of them, but it's winter and wouldn't take the chance. These have to be the worst tire on the market. The wear is horrid. I got 20,000 miles on this tire before they were bald. Rotated every 6,000. Great tire the first year. They hate the slush, front end slides in the corners. They hydroplane. Now have 36k on them wore out and need to replace. But dry roads they are a great tire no noise. Wish they would last longer than 36,000 miles or plug up in the slush at slow speeds. Love these tires. Quiet ride and good off road traction. Very good snow and ice traction. I had these tires for around 20,000 miles. They were at about 50% wear as indicated by a tread gauge. I took a trip out west and on the way back, my rear passenger side tire had a sidewall blowout - neat circular pattern where the tread meets the sidewall there's a groove; that's where it let loose. Fortunately the damage to my Jeep was a bent quarter panel, but it may have been worse if it was a front tire. Up until then they were great tires and I was happy with them. They seemed a bit stiffer than the old Wranglers that came with the Jeep originally, but they did well overall. I couldn't be more pleased with these tires. They did what they were supposed to do. I have 75,000 on them right now and am ready to get some new ones. Great tires for any season. Being a southern Illinois resident, this is highly important...have since traded to a 4x4 Jeep. I still love these tires. I needed some tires that would help me get around in the winter in particular. My 2wd truck was sliding all over. The techs I saw suggested the Firestone's, and I am fully satisfied with the increased traction, road feel, and great looks of these tires. I will put them on my Suburban when it is time for new tires. I have been pleased with the Firestones. They ride very well down the highway and that is where I do most of my driving. They do well when I am hauling my boat and hold up well on the boat ramp. The only draw back is that they slip easily on snowy streets. I know any tire will slide on ice but these seem to spin very easily on snow covered streets. Having said that, the snow covered streets really account for a small fraction of my driving so I would buy Firestone Destination A/Ts again. These tires allowed my tires to do things a 2wd truck shouldn't be able to do. They have done very well hauling my boat on and offroad for a little over 10,000 miles and still look new. I up-sized the tires that were original equipment on my GMC Sierra. These tires ride nice, have excellent traction in snow and they handle well in dry and wet conditions. I have recommended these tires to other friends and they have been equally satisfied. Great tires. I bought two sets of these tires for my truck and my suburban. I get an alignment, rotation, and balance done to get more miles out of them. These are great tires. Have bought a set for my suburban and my Silverado. I get way more miles out of all my tires because I have them aligned and rotated. Overall, it's a very good tire. Well worth the money. No highway noise and the snow traction up here in the hills was excellent. It would have been nice to get more than 38,000 miles out of the set, but you can't have everything. I am extremely pleased with the Firestone Destination tires. I have driven in heavy snow, on the beach, through heavy rains and dry road surfaces without cause for worry or concern. I am currently pricing out for a new set as they are finally needing to be replaced. Great tire. Handles well in all circumstances. Pleased with tread wear. Best tire (out of 3 others) that I have had on my Toyota Tundra. 2nd set on my truck, love them. Great tire!! Awesome tires. I am on my second set now. My first set still had good tread at 60k miles. Awesome off road and super quiet on the road. Hands down, best tires I've ever bought. Great tires. They look great, smooth ride. Good tire except in snow and ice. 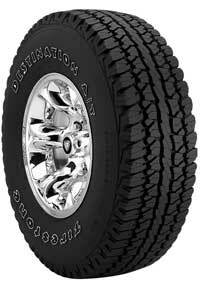 Great tires, handle well on and off road for an all terrain tire. I bought a pair of these to replace the rear tires on my Colorado. Wet traction is great, snow traction not so much, but that's typical for most light trucks. The back end felt considerably "loose" for about the first 1000 miles. Now that they're broken in, I have no complaints. My Explorer rides like a new truck with these tires. They're smooth and quiet on the highway, and they have impressive grip on snow and ice. Good tires. I bought these to fill out my wheel wells a little bit and they look great on my truck. No issues with driving on them either. I purchased an all new set of 5 in September to replace my previous Factor SR/A. I like these tires. So far they have been extremely responsive, especially in the previous rainy months of winter. There is still a lot of ample tread and even tread wear. The problem I had with my previous SR/A was the frequent lose in tire pressure. Definitely no longer a problem with these. They definitely hold air through the bumps in the road. Would definitely recommend these, if you want a reliable, quality made tire that is quiet at high speeds and responsive in all conditions. These tires were more aggressive than OEM Bridgestones and I was afraid they would be noisy. Pleasantly surprised by the quiet ride they provided and the MUCH better balancing. The tires have worked great in all conditions. When new, they are great truck tires. Now they have some miles and they do not work as well. No problems with these tires at all. Either on the road or off road, they performed great. Tires were very good for the first 10,000 miles but developed a vibration at speeds over 45 MPH and will no longer hold a balance. Worst tires I ever owned. I put these tires on in June and they were good when brand new on wet and dry roads. When they wore some and the snow came in December and January they were lousy and they wear out faster than other tires I've had. I'd never buy them again. Worked great for summer months, can't comment for winter as I change rims/tires to Blizzaks. Worked great for general every day driving, and pulling 27 foot holiday trailer.